Leung, Parie. "Dora Awards". The Canadian Encyclopedia, 31 May 2018, Historica Canada. https://www.thecanadianencyclopedia.ca/en/article/the-dora-awards. Accessed 18 April 2019. The awards are presented at an annual gala event. A collection of Dora Awards prior to their presentation (photo by Blair Francey). 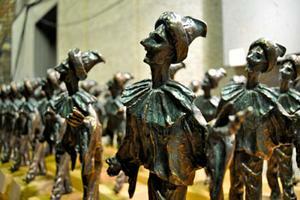 The Dora Awards were founded in 1978 to recognize outstanding professional theatre in Toronto. The awards are named in honour of Dora Mavor Moore, a theatre teacher and director who contributed extensively to the development of Canadian professional theatre. The awards are presented at an annual gala event. Open to theatre professionals in Toronto who are members of the Toronto Alliance for the Performing Arts, the awards recognize outstanding achievements in acting, directing, design, choreography, composition and dance performance in the following divisions: general theatre, independent theatre, theatre for young audiences, dance and opera. The Dora Awards include the Barbara Hamilton Memorial Award for excellence in the performing arts and advocacy of the arts in Canada; the George Luscombe Award for theatre mentorship; the Leonard McHardy and John Harvey Award for arts administrators; the Pauline McGibbon Award for unique talents and the potential for excellence; and the Silver Ticket Award for outstanding contributions to the Toronto stage. A list of nominees and past winners is available at the Dora Awards' official website.